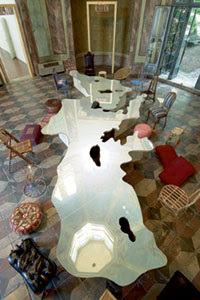 The Spanish artist collective Portales del Arte will be exhibiting prints, paintings, drawings, and sculpture in two galleries at the University of the Arts October 29 – November 6, 2010. Portales del Arte is comprised of ten artists working in several mediums. With this, their first exhibition as a group in the United States, it’s fitting that their exhibition Mediterráneo praises and embraces the conceptual and expressive meeting points shared by artists and writers of various cultures working in many different mediums. Mediterráneo is part of a travel/exhibition exchange between the Spanish collective Portales del Arte based in Lorca and the Printmaking/Book Arts community from the University of the Arts in Philadelphia in the United States. Within the time period of the exhibitions the artists will travel to each other’s region to partake in a cultural exchange. Portales del Arte will be visiting Philadelphia October 30 – November 6 and they will be present for the reception at The University of the Arts on the evening of Monday, November 1. 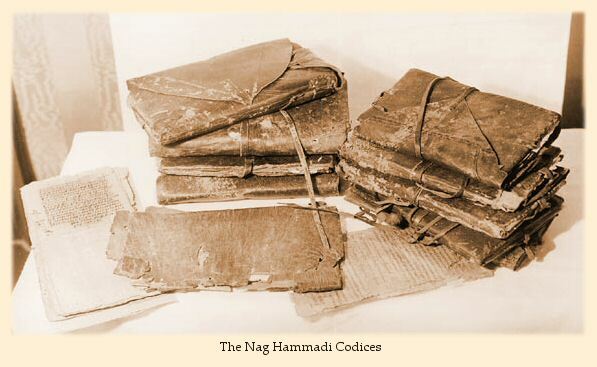 Julia Miller, former senior conservator on the staff of the University of Michigan conservation lab, will discuss the Nag Hammadi Codices. Ms. Miller will focus on the 1945 find along with related discoveries in terms of bookbinding history and materials. Click here to RSVP to this event or call 215-546-3181. Saturday, October 30, 1 p.m.
Join the procession as Michelangelo Pistoletto rolls a giant ball of newspapers made by Spiral Q Puppet Theater through Philadelphia, beginning at the Philadelphia Museum of Art’s West Entrance—rain or shine! 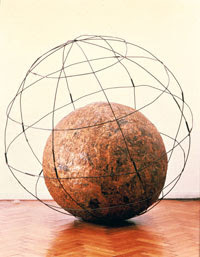 The artist will recreate his seminal action Walking Sculpture, first performed in 1967 on the streets of Turin. For more information, visit philamuseum.org. Four half-day workshops are offered. Skillman Library’s Simon Room Gallery is hosting a traveling exhibition of the Guild of Book Workers, a national organization for book artists founded in 1906. 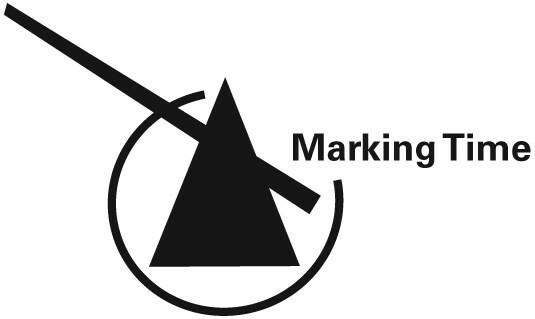 The juried exhibit, "Marking Time," highlights the diverse talents of Guild members, who include bookbinders, conservators, and calligraphers. The show includes nearly 50 works interpreting the theme of time, ranging from contemporary books of hours to considerations of the end of time. Leather bindings stand alongside contemporary bindings that have been dyed, collaged, or integrate photography. Text and imagery incorporate calligraphy, painting, woodcut, letterpress, and digital output as well as wooden constructions, hand-held toys, and other sculptural objects. 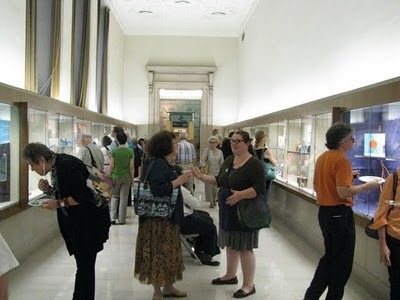 Exhibit curator is Karen Hanmer, who is a Chicago book and installation artist, whose work is included in the collections of the Tate Britain, the National Museum of Women in the Arts, the Library of Congress, Graceland, and a number of college and university libraries, including Lafayette. Two Weeks Left to See Space & Sequence! To see more images from the opening reception click here. There are still a few spaces available in both workshops! Deadline to apply is this Sunday. 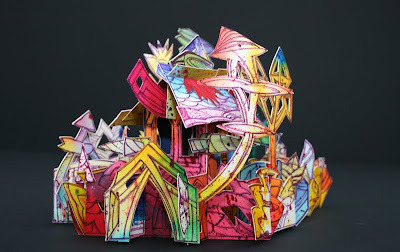 Paul Johnson creates amazing books from single sheets of paper that are architectural in structure with nothing added, nothing taken away, and no glue. He uses paper weaving techniques and interlocking, dove tail joints to make books that are like taking a reality tour through a building complex – a kind of paper Le Corbusier. Paul Johnson is internationally recognized for his pioneering work in developing literacy through the book arts and as a book artist. He ran the Book Art Project from Manchester Metropolitan University and is the author of over fifteen titles including A Book of One's Own and Literacy Through the Book Arts. His work is in most of the major USA collections including the Cooper-Hewitt Museum in New York and the Library of Congress, Washington DC. The craftsmanship of making ink. This video is beautifully entertaining for you ink lovers.